We’re working with several companies right now who are trying to establish an appropriate budget for their marketing campaigns in 2016. Each of them has asked for historical benchmarks for their industry. I’ve done a little bit of research for you on this topic and have compiled the information below. I’ve also included a well-researched infographic that sheds some additional light on the subject. Here are a few tips you should consider when you’re trying to establish your marketing budget. The starting point is to understand the concept of a marketing-to-sales ratio. The good news is that a marketing-to-sales ratio is no more complex than it sounds. It’s essentially the ratio of your marketing budget to your overall sales. As an example, if your company generates $100 million in revenues in a given year, and your marketing budget is $5 million, then your spending 5% of revenues on marketing. That’s a 20-to-1 ratio, but it’s easier (and more common) to think of it as a percentage of overall sales. Let’s start with some general figures. Walmart spends about 0.4% of sales on marketing, but before you go out and cut your budget to match their percentage, remember that Walmart’s revenues last year were $482.2 billion. That means their marketing spend was approximately $1.92 billion! What do their competitors spend? Target spends closer to 2% of sales on marketing, while Best Buy spends upwards of 3% and Macy’s spends about 5%. There are some other ratios you’ll want to be aware of — automakers spend about 2.5% to 3.5% of revenue on marketing, liquor companies spend about 10.5% to 14.5% on marketing, and packaged goods companies spend 4% to 15% or more on marketing. Professional services companies will typically spend 5% to 8% on marketing, unless they’re a start-up or trying to investment spend for growth in which case the number can be as high as 15%. What are some other industry benchmarks? Here’s some data gathered by Schonfeld & Associates a few years ago based on SEC filings. 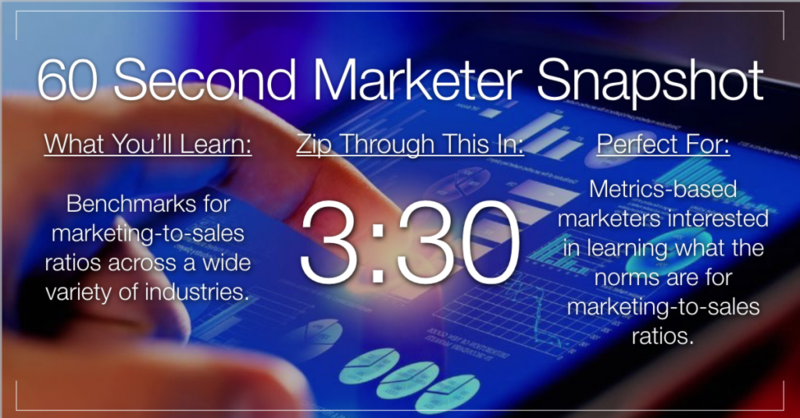 Still interested in learning more about marketing-to-sales ratios? Here’s an excellent infographic created by our friends at Vital Design which sheds some additional light on the subject. About the Author: Jamie Turner is the CEO of the 60 Second Marketer and 60 Second Communications, a marketing optimization firm that helps businesses improve the impact of their marketing by 10% or more. He is the co-author of “How to Make Money with Social Media” and “Go Mobile” and is a popular marketing speaker at events, trade shows and corporations around the globe.